Iraqi Peace Activist Forced to Change T-Shirt Bearing Arabic Script Before Boarding Plane at JFK | Democracy Now! In Iraq at least 20 people were killed and more than 300 injured on Sunday in attacks on Shiite pilgrims gathering for a mass religious festival in Baghdad. The shootings occurred despite heavy security measures imposed by US and Iraqi forces that included a weekend driving ban in the capital. About 1,000 people were killed during the Shiite holiday last year when rumors of a suicide bomber triggered a stampede. The killings on Sunday highlighted tensions between Sunni and Shia Muslims that is claiming about 100 lives a day in Iraq and stoking fears that the country is moving towards a full-blown civil war. In July alone, the Baghdad morgue reported more than eighteen hundred violent deaths. In a sign of how routine the killings have become, the US military reported “relatively little violence” following Sunday’s attacks. Earlier this month, a delegation of peace activists from the United States met with Iraqi parliament members in Amman Jordan to discuss issues concerning Iraq’s reconciliation plan as well as the withdrawal of US troops. The delegation met with representatives of the largest Shia and Sunni groups as well as with religious leaders and human rights organizations. We speak with Raed Jarrar, the Iraq Project Director for Global Exchange about his trip to the Middle East. But first he talks about how he was barred from boarding a flight at JFK airport because he was wearing a T-Shirt bearing Arabic script. AMY GOODMAN: Raed Jarrar joins us in a studio in San Francisco, the Iraq Project Director for Global Exchange. He is an Iraqi blogger and architect, who runs a popular blog called ” Raed in the Middle.” Before we talk about the latest in Iraq, Raed, I wanted to ask you about — well, starting at the end, your trip home, how you made it back to the United States. AMY GOODMAN: That’s what the security said to you? RAED JARRAR: Yeah. I was questioned by four officials from — I think some of them were from Jet Blue and others were maybe policemen or FBI. I have no idea. I took their names and badge numbers, and I filed a complaint through ACLU against them, because I asked them very directly to let me go to the airplane, because it’s my constitutional right as a U.S. taxpayer and resident to wear a t-shirt with Arabic script. And they prevented to let me exercise this right, and they made me cover the script with another t-shirt. AMY GOODMAN: Also in this article it talks about others, as you were just talking about. “Websites used by pilots and cabin crew were […] reporting further incidents. In one, two British women with young children on another flight from Spain complained about flying with a bearded Muslim even though he had been security-checked twice before boarding.” Raed Jarrar, let’s talk about the larger context right now of the Middle East and what’s happening. Can you talk about your trip, why you went on this CODEPINK-sponsored trip to Amman, what you learned there? And then we’ll talk about the latest in Iraq. RAED JARRAR: The trip was an answer for what Mr. al-Maliki, the Iraqi prime minister, have done when he came to the U.S. Global Exchange and CODEPINK and other organizations, United for Peace and Justice, we tried to contact Mr. al-Maliki before he came to the U.S. during his last visit and requested a meeting with him. We asked him to meet with representatives of the antiwar movement and to speak with them about, you know, some proposals or ways of supporting the Iraq reconciliation plan, and, you know, what can be done from the U.S. side to finish the occupation of Iraq. Unfortunately, Mr. al-Maliki prefers to just go have some meetings with the U.S. Bush administration’s officials and maybe he met the troops and thanked them for, quote/unquote, “liberating Iraq,” and he denied — he refused to meet with the representatives of the peace movement. That’s why we put together a meeting with Iraqi representatives from the Iraqi parliament to discuss with them alternative solutions for the current occupation in Iraq. So we put together three major meetings with representatives from the biggest Sunni coalition in the parliament, the biggest Shia coalition in the parliament, and the biggest working secular and liberal group in the Iraqi parliament, because we wanted to find other channels in dealing with the Iraqi government, other than al-Maliki and the few people around him, who are repeating the same Bush administration’s lies and excuses for keeping the troops there. So our meetings were very fruitful, in fact, especially the one with the mainstream Sunni and Shia parties, because we got this strong united message from Iraqi Sunnis and Shia demanding a timetable for pulling out the U.S. troops. And they were very clear about demanding to take their country back. They said, “We want our country back. We want the U.S. troops to put a timetable for withdrawing the troops, because our country is deteriorating. The situation is getting worse, and the U.S. has proven that they cannot control Iraq. So we want our country back. And we want the U.S. to leave.” And this contradicts completely with al-Maliki’s shameful position, when he came to the U.S., you know, and gave the exact different or opposite image. So I think the visit was important for us as representatives of the peace movement, to deliver this important message, even from the Iraqi government, that many people are still calling it a puppet government in the U.S. When you come to the Iraqi parliament, there is a vast majority of parliamentarians who are requesting an end of this war and dealing with its consequences by either compensating Iraqis or fixing the destruction that happened because of the illegal war. AMY GOODMAN: We’re talking to Raed Jarrar, the Iraqi Project Director for Global Exchange, runs the popular blog, ” Raed in the Middle.” We’ll be back with him to talk about some newspaper reports of private meetings President Bush has been having, discussions of whether democracy should be supported in Iraq and also questioning why the Iraqi people aren’t expressing more gratitude. We’ll also play a clip of John McCain calling for more troops in Iraq and get Raed Jarrar’s reaction. Stay us with. AMY GOODMAN: Our guest is Raed Jarrar, joining us from a studio in San Francisco, just back from a trip to the Middle East. Raed, I wanted to get your response to Arizona Senator John McCain, who said this Sunday he still thinks more troops are needed on the ground in Iraq. His comments came in an interview on NBC’s Meet the Press. Host David Gregory asked McCain about U.S. troop levels in Iraq. SEN. JOHN McCAIN: The question is, are we going to be able to bring the situation under control now? I still believe we can. I think part of it has to do with the Mahdi Army and Sadr. Sadr has got to be taken out of this equation, and his militia has got to be addressed forcefully. DAVID GREGORY: But to do that, do you need more U.S. soldiers on the ground now? SEN. JOHN McCAIN: I think so. I think so. We took troops from places like Ramadi, which are still not under control, to put them into Baghdad. We’ve had to send in additional troop, as they are. All along, we have not had enough troops on the ground to control the situation. Many, many people knew that. And it’s — we’re paying a very heavy price for it. AMY GOODMAN: Raed Jarrar, if you could respond to Arizona Senator McCain. RAED JARRAR: I don’t know that there is a lot to be responded to, because it seems that, you know, many people in the administration are still not getting it. They’re not getting that the situation in Iraq will not get any better by sending more troops and by killing more people and by increasing the violence in Iraq. And then, the only way out of Iraq is to depend on Iraqis and believe in the right of Iraqis in ruling themselves, to believe in democracy for Iraqis, for real, not the American way. So sending more troops will make things more complicated. It will increase more clashes. And this myth of destroying al-Sadr’s movement is just a big joke, because al-Sadr movement is expected or, like, estimated to contain around five million Iraqis. So, I don’t know how many U.S. troops have to be sent to destroy five million Iraqis. AMY GOODMAN: Can you talk about the latest violence in Iraq? It’s painful, it seems, that any question you ask about Iraq has to talk about the latest violence there, but this weekend, the shooting of the Shia pilgrimage. So mostly people are accusing the U.S., unfortunately, of interfering to increase the sectarian violence, because they see that it’s the Bush administration’s benefit to increase this violence and justify longer presence in Iraq, longer interference in Iraq. And, like, you know, it’s widely used now as the only justification. AMY GOODMAN: Raed Jarrar, I wanted to read you a few paragraphs from the New York Times. 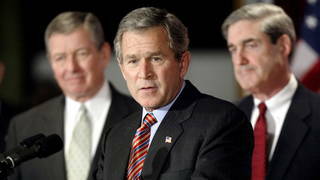 It says, “Some outside experts who have recently visited the White House said Bush administration officials are beginning to plan for the possibility that Iraq’s democratically elected government might not survive. 'Senior administration officials have acknowledged to me that they are considering alternatives other than democracy,' said one military affairs expert who received an Iraq briefing at the White House last month,” and agreed to speak on condition of anonymity. He said, “Everybody in the administration is being quite circumspect,” the expert said, “but you can sense their own concern that this is drifting away from democracy.” Your response? RAED JARRAR: My response is that this is very expected since the day that the U.S. entered Iraq. There were many observers who were expecting another Algeria case to happen in Iraq, where the U.S. would reach to a position and discover that the majority, or the majority ruling Iraq, the Shia majority that is ruling Iraq now, it will turn into anti-occupation, and they have better and stronger relationships to their neighbors in Iran than their relationships to the U.S. So it’s not in the benefit of the U.S. to let this, you know, even a very primitive and weak democracy in Iraq to be growing. We shouldn’t forget, by the way, that the U.S. was against building a democratic system from the beginning. When Paul Bremer first went to Iraq, he just selected 13 people and made the governing council. And the Iraqi Shia went to the streets, and they demanded to have elections. They wanted to have an elected government, instead of the selected government that the U.S. brought — you know, some of these usually imported puppets that the U.S. brought with. So the U.S. did not really come with a democratic project, because they knew that they will end up having nationalists, anti-occupation people, who, if they wanted to have any good relationships with someone from outside Iraq, it would not be the U.S. It would be Iran, or it would be other Arab and Islamic countries. So the U.S. now is realizing this, especially after the war on Lebanon, where Iraqi Shia, like especially al-Sadr movement, spoke very, very strongly against the attack on Lebanon, and the people went in the streets in big demonstrations, carrying Lebanese and Iraqi flags and saying, “We want to fight against the occupations of the region. We want to fight against the British, the American, and the Israeli occupations.” So it’s clear now for the U.S. that what happened in Iraq during the last three years actually produced an anti-occupation government, and all of the attempts of claiming this government and saying, “We are there because the Iraqis want us,” are failing now. So the U.S. will try to go back to their original plan and put — just insert yet another dictatorship in the Middle East that will be — that will listen to what the U.S. will be saying, another dictatorship like Egypt or Jordan or Saudi Arabia or like, you know, the many other dictatorships supported by the U.S. So they want to insert yet another dictatorship regime in Iraq and forget about all of these big slogans of democracy, because, you know, it doesn’t work for them. AMY GOODMAN: Raed, you also traveled to Syria, where you visited a number of Lebanese refugee camps. Thousands of people fled to Syria following Israel’s attack on Lebanon. Can you talk about what you saw there and the level of support for Hezbollah in Syria? RAED JARRAR: The level of support of Hezbollah in Syria and in Jordan is unbelievable. I mean, I lived all of my life between Jordan and Iraq and Saudi Arabia, and I have never seen so much support of Hezbollah or, like, supporting Hezbollah this much, at least. But this time, especially in Damascus, you can’t go to a street without finding a Hezbollah flag. You can’t go to a place without finding Hezbollah posters, Nasrallah posters with Bashar al-Assad, and even sometimes the Iranian President Ahmadinejad. They have all of these pictures, like all around the streets. So you can feel that even the sense of anti-Americanism and, like, hatred to the U.S. increased very much in a very unfortunate way that even prevents us, as people who are representing the antiwar or peace and justice movement, from going there. It’s like burned bridges with many countries in the Middle East. And like, you know, it made Israel and the U.S. less secure, made Hezbollah, as a means or tool for armed resistance, one of the only choices that people are supporting. So what happened there during the last one month’s war against Lebanon is so tragic. It’s just a tragic, devastating political mistake that turned the region into more extremism and into more potentiality to have violence.